After tying to game 95-95 with just under 15 seconds to go, The Warriors suffered a tough loss in the first game of the NBA Playoffs. Unfortunately, they suffered an even bigger loss as Forward David Lee injured his right hip flexor and will be out for the rest of the season. 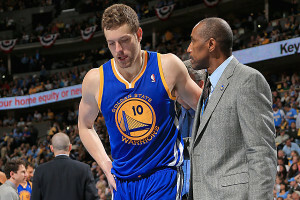 DENVER — Warriors All-Star forward David Lee is out for the remainder of the playoffs with a torn right hip flexor. MRI taken Sunday confirmed he sustained a Grade 3 tear, which requires months to heal. The Warriors confirmed the results of the MRI Sunday morning. The injury happened at the 11:34 mark of the fourth quarter in Game 1 of the Warriors’ series with Denver. He drove down the right side of the key for a layup and was fouled in mid-air by Nuggets center JaVale McGee, knocking Lee off balance. He came down on his right foot, which appeared to jam into the hardwood and causing an awkward contortion. 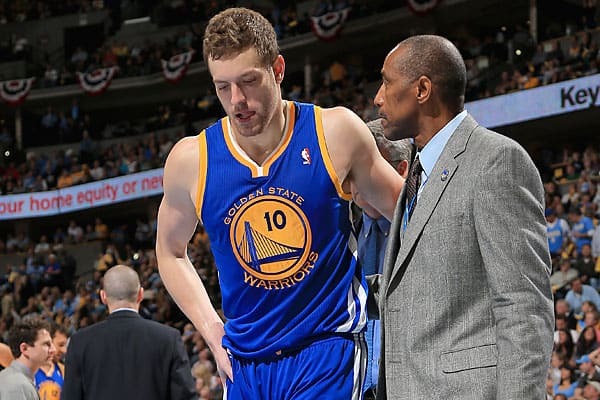 It was clear immediately something was really wrong as Lee squirmed on the court, Golden State forward David Lee leaves the court Saturday with coach Mark Jackson’s help after being knocked to the floor. Lee hurt his right hip. ( Aaron Ontiveroz, The Denver Post ) (Aaron Ontiveroz / Denver Post ) grunting and grabbing the top of his right thigh. “Ahhhh, I felt a pop,” Lee could be heard saying on the video of the injury. The preliminary diagnosis was a strained right hip flexor. The MRI confirmed Lee had the worst possible kind. Game 2 of the Warriors-Nuggets first-round series is Tuesday in Denver.